Cosmic Music at 432 Hz : Healing Frequency ! 8Hz is also the frequency of the double helix in DNA replication. Melatonin and Pinoline work on the DNA, inducing an 8Hz signal to enable metosis and DNA replication. A form of body temperature superconductivity is evident in this process. On the musical scale where A has a frequency of 440Hz, the note C is at about 261.656 Hz. On the other hand, if we take 8Hz as our starting point and work upwards by five octaves (i.e. by the seven notes in the scale five times), we reach a frequency of 256Hz in whose scale the note A has a frequency of 432Hz. In contrast, the frequency chosen in London in 1953 as the worldwide reference frequency and which all music today has been tuned to, has come to be defined as ‘disharmonic’ because it has no scientific relationship to the physical laws that govern our universe. 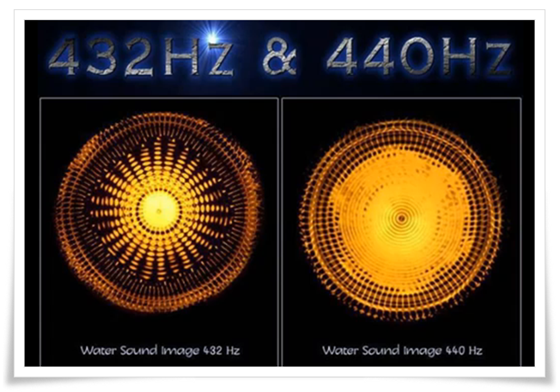 Opening your ears for music that has been tuned to the “scientific” 432Hz frequency would benefit the entire planet and everyone who lives on it, while listening to music tuned to the “disharmonic” 440Hz frequency does harm by causing stress, negative behaviors and unstable emotions. The neo-cortex of the brain, 90% unassigned becomes awakened in this synchronization, and one then operates in all brain cell dendrites with the maximum information flow possible on that scale.
" Ordinary" awareness brain waves ranges from 14-40 hz. Here one is operating only in some brain cell dendrites, and predominantly with the left brain as the centre of activity, where information flow is billions of times slighter (like using an old PC 386 compared to a parallel process Pentium IV, or an old Mac Performa, compared to a Parallel processing G4). In other words at 8 hz one is an operating supercomputer, or congressing towards Superconsciousness. It is often cited that humanity only uses 10% of the brain (for someone like Einstein, who profusely meditated his equations in ecstasies), and Einstein relays in his General Relativity Theory, that were the other 90% to become assigned, e = mc4 would result. Einstein states that the body would transform into pure energy: the resurrection/ascension of the Gnostic traditions of the west, the Rainbow Body and Diamond Body as it is known to the Tibetan Buddhists and Taoists of the far east. 8 hz then is possible the key to such a potential full Sovereign brain activation. At the least it is a Golden Midway Bridge towards that internal Revolution. Dr. Andrija Puharich demonstrated in the late 1970s (Proto-Communication II), that 8 hz could not be blocked by any electromagnetic shielding metal or even a triple vacuum. Which implies that it rotates through the Virtual (Everywhere and Everywhen) and quantum non-local hyperspace, constantly. Ortho-rotating through what the Hermetic Gnostic and Shaman Psychonauts may have attempted to grapple with under the term, loosely appropriated as "Spirit", and the Taoistic Wu Chi. A film was made in the Himalayas in the 1930's showing a group of Tibetan monks, who with the use of ordinary Tibetan musical instruments, would gather into a pie-shape configuration and direct their playing towards a huge boulder that was located on the ground roughly one hundred fifty feet away and at the base of sheer rising mountain wall. About three minutes after the 'concert' began, the boulder began to vibrate and lift off the ground. A moment later, it shot up about 150 feet into the air and landed on a ledge above it, where other monks were using the boulders to seal the entrance of meditation enclaves that they had cut into the sides of the mountain.